Researchers at the Swedish University of Agricultural Sciences have discovered one healing food that could be a natural remedy against oxidative damage. What’s more, this food grows in just about everyone’s front yard or backyard. It makes a delicious tea that’s full of antioxidants and it’s easy to cultivate and use right in your own kitchen. What’s the name of this functional food? Rosehips. Not familiar with rosehips? They are the berry-like fruits on rosebushes that are left behind after the flowers have died. They’re usually red or orange in color. Nearly all rose bushes produce rose hips, however the rugosa rose produces the best ones to eat. 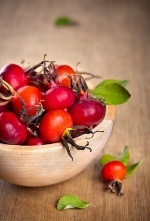 You have likely tasted the tangy, sweet flavor of rose hips in herbal teas. Rose hips are a rich source of vitamin C — in fact, higher than that found in citrus fruits. During World War II, when supplies of citrus fruits were running short in Great Britain, everyone went into action to harvest wild rose hips wherever they could find them. The rose hips were then made into a syrup, which was used as a vitamin-C supplement for children. Swedish researchers recently evaluated the antioxidant capacity of rose hips. Rose hips, the researchers acknowledged, have become popular in health-promoting products, as the fruits contain a high content of bioactive compounds. The aim of this study was to investigate whether the health benefits of rose hips are due to ascorbic acid, phenols, or other rose-hip-derived compounds. A freeze-dried powder of rose hips was studied in the lab to determine how well it could prevent oxidative damage. In particular, the researchers looked at rose hips’ ability to protect erythrocytes. Erythrocytes, or red blood cells, are the most common type of blood cell. They are your body’s principal means of delivering oxygen to your tissues — so these cells very important! The antioxidant uptake of the rose hip extract was confirmed by measurement of its catechins. The researchers concluded that rose hips exerted significant protective effects on erythrocytes, proving that rose hips contain a promising level of clinically relevant antioxidant protection. To find out about another healing food chock-full of antioxidants, read the article, Smelly Superstar Is First in Disease Prevention.